The Recorder newspaper features one of our junior sailors in this artice about the Tasar Nationals held at Largs Bay. The Tasar Travellers event was held on 21st October in Port Pirie. 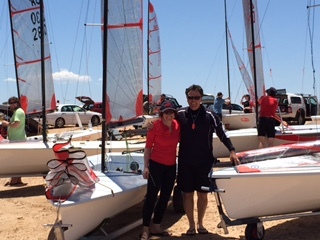 Thirteen Tasars from Adelaide and Wallaroo came to compete against five RPPYC Tasars in windy and blustery conditions. Three short races in the basin were run and by the time they were finished the wind was up to 20 knots. 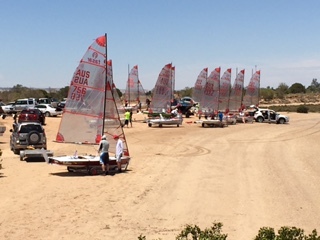 There were a number of capsizes and everyone was challenged by the conditions in the basin. This season so far has been very windy. Seventeen Tasars competed in the State Heats held last weekend at Port Pirie, four local boats, one from Wallaroo and the rest from Adelaide. The course was a long sausage shape held between markers 45 and 40 with the start and finish in the middle at marker 42. The breeze was somewhat patchy until the start of the race when it picked up to about 10 knots getting stronger as the race continued. At the start of the second race at around 3.15 the forecast change blew in with a vengeance and there were numerous capsizes and boats being blown to the shore to wait for a tow. The three support boats were busy towing exhausted sailors back to the beach while a few managed to make it on their own. Almost everyone had at least one capsize or was blown ashore. The advice given during the briefing for everyone to stay within the channel markers and to keep away from the shallow edge was impossible to follow as many sought a refuge from the wind to wait for a tow. As a consequence there were stories of the problems of trying to keep a footing and hold the boat upright while being sucked into metre deep mangrove mud. Not a problem that our visitors usually have to cope with while sailing off metro beaches. We recorded a gust of 27 knots while back on the beach but believe it was stronger than that on the river where the course was set. The third race was cancelled by Kaz Eaton, the Officer of the Day and everyone still upright headed back to de-rig their boats and come back to the club rooms. A huge thank you to Wayne, Doug and Roger on the support boats and to Syd, Kaz and Peter on the committee boat who also assisted stricken sailors. The theme of the evening’s entertainment was Royalty and many dressed up to suit. The quiz was also Royal in theme and six tables battled to answer questions on subjects relating (sometimes obscurely) to Royalty. Table number three were the winners, people obviously well versed in Royalty trivia. Sunday was a very different sailing day with overcast sky a strong tidal flow and no more than six knots from the north west to west. This resulted in what we call a ‘soldiers march’ with reaches up and down the course and once positions were established they remained in place with little variation throughout the races. The results will be made available later through the Tasar association. Our club would like to thank the SA Tasar association for their support for us in hosting this event in Port Pirie. We appreciate that sailing along the Pirie river isn’t to everyone taste but hope that they all enjoyed the challenges we faced. After two mast breakages, a capsize onto the edge of the river with the crew floundering around trying to control a boat intent on sailing down wind with the sail horizontal to stinking, metre deep black mud and one boat capsizing repeatedly, the race was abandoned. Only ‘Yack Yety Yak’ finished the race properly. ‘Rumline’ broke her mast in the first lap and was towed back to the beach. ‘Final Fling’ and ‘Too Old For What’ saw the sense in not trying to sail in 20 knot plus winds and headed home fast. ‘Kinetix’ had a few too many capsizes and pulled out leaving ‘Spiderman’ to attempt to finish the race only to find the finish line had disappeared and the committee boat heading down river to pull the top marker up while the Rubber Duck manned by Wayne and James Growden rescued ‘Mr Bean’ who had finally sailed off the mud, looking filthy, with the crew’s shorts and booties full of grit and slime, only to have her mast collapse in a gust,breaking the bottom section at the spreader bars. Meanwhile the catamaran playing around in the turning basin had capsized, turning turtle so Richard and Chris had to swim out to help right her and bring her back to the beach with Sony. There we compared damage both to boats and bodies and returned to the club for a hot shower. The heroes of the day were Wayne and James who proved invaluable in towing stricken boats back and helping to right capsized boats. By the time we got back to the club the wind had dropped to a moderate breeze preparing for the raging southerly that came a while later. contact us via our contact page. Sailing Saturday afternoons between October and April. Friday night drinks from 5 pm at the club.